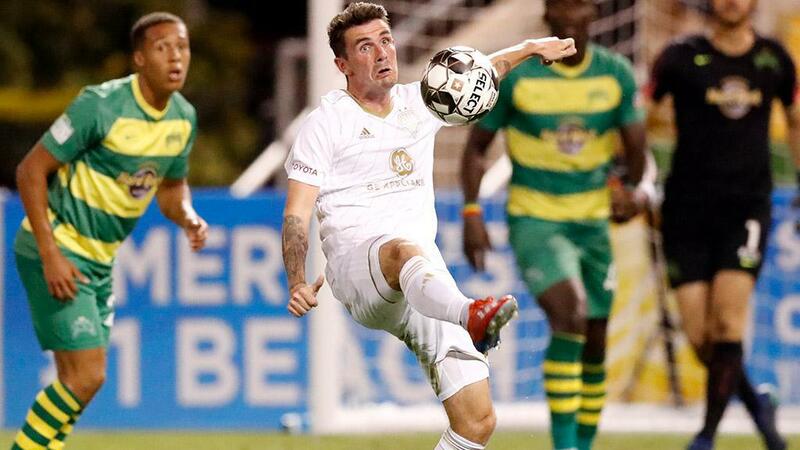 ST. PETERSBURG, Fla. – It’s inarguable that the past three weekends haven’t produced the sort of results Louisville City FC has become accustomed to. But there is one thing that the club’s fans can hold true to. The faces may have changed, but the culture within the locker room is exactly as it was when LouCity was lifting back-to-back USL Cups. Everyone knew the past two outings, home defeats to Birmingham Legion FC and Pittsburgh Riverhounds SC, were not acceptable. There was even the chance that a third successive defeat was to follow as the side trailed the Tampa Bay Rowdies on Saturday night at halftime at Al Lang Stadium. And then Louisville showed why it has lifted the silverware after the final game of the season each of the past two seasons. A side that included only three players that started against Phoenix Rising FC last November put on a show of collective will, and moments of brilliant skill, that in the end left the visitors disappointed to walk away with only a 1-1 draw to show. To earn even a point meant doing something that no prior visitor to Al Lang Stadium had managed this season; find the net against the Rowdies’ formidable defense. With Yann Ekra and Dominic Oduro forming a shield in front of the back three that included former Louisville standout Tarek Morad, the visitors had difficulty breaking down Tampa Bay in open play during the first half. And even when they did – Head Coach John Hackworth’s adjustment to overload to the left half of the field and find passing lanes in behind the back line serving to tilt the field in LouCity’s favor after the break – there stood goalkeeper John McCarthy in the Rowdies goal, making show-stopping saves to make it feel like LouCity’s efforts would be in vain. But in the 88th minute, on the eighth shot on goal of the night for the visitors, the breakthrough arrived. Magnus Rasmussen, key throughout the second half, half-wove and half-bulldozed his way into the Rowdies penalty area. The ball broke off a Rowdies defender as cover converged and sat perfectly for Abdou Thiam, who as all good strikers do sat in anticipation that something would break his way. Thiam’s finish to the bottom right corner gave Louisville its reward. One of the new faces that has been called on to fill the shoes of those departed or currently sidelined to injury, Thiam understands the responsibility stepping into a locker room like Louisville’s brings. As the culture of the club gets passed on from those who have been there since the start like McCabe to those newly embracing the challenge like Thiam, the new guys showed on Saturday that the standard in Louisville hasn’t slipped.